Why does my family have the worst luck with tires? 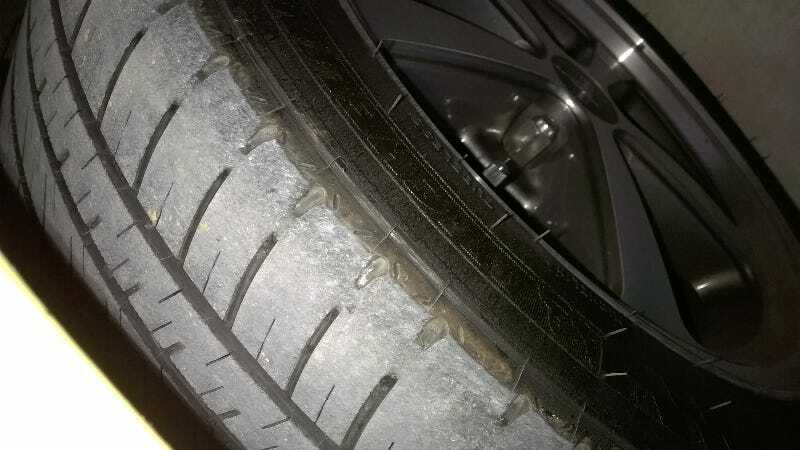 Last week I was looking at my tires when I noticed that the entire outside of the tire was worn (Shown above). Now I need a new set of tires, and evidently I got the most expensive ones I could’ve gotten (Michelin Pilot Sport A/S 3's). And this is far from the only tire related issue we had. A few weeks ago my dad found a nail in his tire, and because the car will be tracked soon we just couldn’t get it patched, which it couldn’t have anyway. A few months before that, my mom’s Cadenza had a nail in one of her new tires. Before that, my dad’s last Mustang had a tire get slashed from a piece of metal on the road. And then once I got my new tires about a year and a half ago, I got a nail in an un-patchable place. So now I’m out about 500 because it’s obvious I need an alignment and I’m going to just get two tires. The only place that can get both the tires and alignment is a place that tried to rip me off 1200 dollars for simple repairs to make things that much better. It kills me, 8 thousand on these tires, the rears still look great. Which means the alignment issue was recent or my Ford dealer never did rotate them back in January. I don’t think I can drive much more on them to. Gotta love cars. Here’s another. EDIT: I also should say, I got new tie rods, ball joints and alignment done a year and a half ago along with the new tires. It seems strange that the tires wore so quick all the sudden. They stayed looking brand new all in 2014. Is it possible something else is wrong?